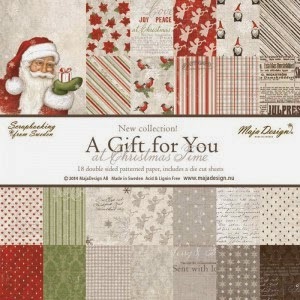 A winter project for you today featuring Maja’s “A Gift for you” collection. Added my favorite color, turquoise! I took a reversed canvas and started to decorate with papers from the “A Gift for you”. *shipped from the North Pole* for the inside of the canvas. For the border of the inner frame and the roof of the birdhouse I used the *when the snow is falling*. This cute little bird was found between a lot of xmas decorations at a local store. Added some puffy paint around the edges to give it a more wintery look. On some spots on the canvas I glued some bits of kitchen paper towel and added a mix of modeling paste with 13 Arts glass filler. Once dry, I painted the brown and turquoise colors and gave it a touch of gesso for more effect. 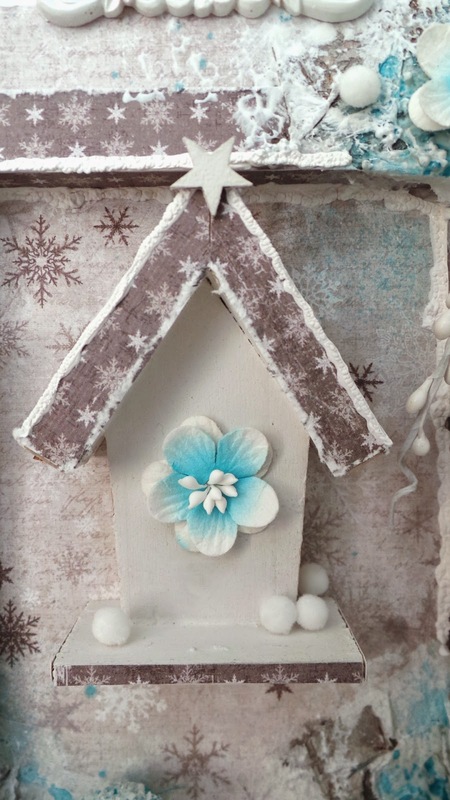 The small birdhouse gives it a great 3D effect. 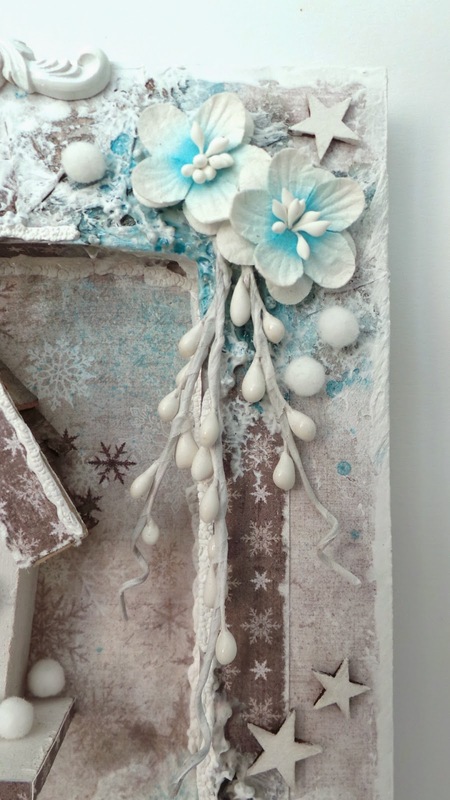 Some flowers and the white resin at the top of the canvas are from Scrapberry’s, together with the lovely white twigs from 13 Arts. The birdhouse with the *when the snow is falling* papers. Some white cotton balls to give it a more wintery feel. The cute bird sitting on some twigs from 13 Arts. Wishing you a warm and cozy day! This is just stunning Ingrid! You have inspired me to try some of your techniques on a canvas of my own. I just finished a Santa altered canvas (seen a href=http://www.darscraftycreations.blogspot.com/2014/12/the-many-faces-of-santa.html>HERE) but nothing as elaborate as this … thanks for sharing your wonderful art with us … very inspiring! Such a lovely Santa canvas Darlene! Gorgeous as always Ingrid, you’re a master of altered art! !